On the way down to this quiet area, take in breathtaking views of the white-sand-rimmed coastline. As you near the lower part of the road, you will see the rusting remains of a WWII liberty ship sitting on the shallow reef, most of it above water. (Liberty ships were the workhorses of World War II, the largest class of civilian-made warships ever built.) At the end of the road are ancient Hawaiian rock carvings (petroglyphs) and the start of an eight-mile beach trail to Polihua Beach. Hiking this trail's entirety may not be for everyone, but about a mile down the beach is the liberty ship, with excellent beachcombing and views of other shipwrecks on the way. Accessible mostly by four-wheel-drive, this secluded white sand beach was once a major egg-incubating area for sea turtles. A trail hike eight miles to the southeast will lead you to Shipwreck Beach. This bay's pristine waters and soft white sand give it the distinction of being one of Lana'i's finest beaches and possibly the best snorkeling area in the Hawaiian Islands. Picnic spots and the island's only official camping area are partly shaded by palms. Visitors can swim, shore dive and snorkel at Hulopo`e Bay. Complimentary snorkeling and beach equipment are available for guests staying at Lana`i’s hotels. Visitors may also sign up with one of the island’s recreational companies for snorkeling, shore diving and sea kayaking excursions. Lana`i’s recreational companies offer professionally guided snorkeling, scuba diving, sailing, and deep sea fishing expeditions in the amazingly clear waters between Maui and Lana'i. Cathedrals, along Lana`i’s southern coast, is a magnificent diving area, with an unrivaled reef community and visibility typically reaching at least 75 feet. It is one of the reasons Skin Diver magazine rated the island among the top 10 snorkel and scuba sites in the world. You can also sign up for diving lessons and sunset cruises. Whale & Dolphin Watching: Each winter, from mid-November through mid-May, approximately 3,000 humpback whales travel from Alaska's frigid waters to the sheltered shores around Maui, Molokai and Lana'i to birth their young and mate. Whale-watching on organized expeditions or while you're traveling to Lana'i via Expeditions’ ocean shuttle service are popular ways to view this magnificent creatures. Today, only 7,000 to 8,000 humpback whales exist in the wild. Humpback whales average 45 feet in the length and weigh about one ton per foot. Their newborns calves are one-and-a-half to three tons in weight, and consume 80 gallons of their mother's milk daily. Whales are protected in Hawaiian waters, and federal laws regulate whale-watching activities in order to ensure the animals’ comfort and wellbeing. You can also encounter the humpback's smaller cousins, the Hawaiian spinner dolphins, in the waters around Lana'i year round. 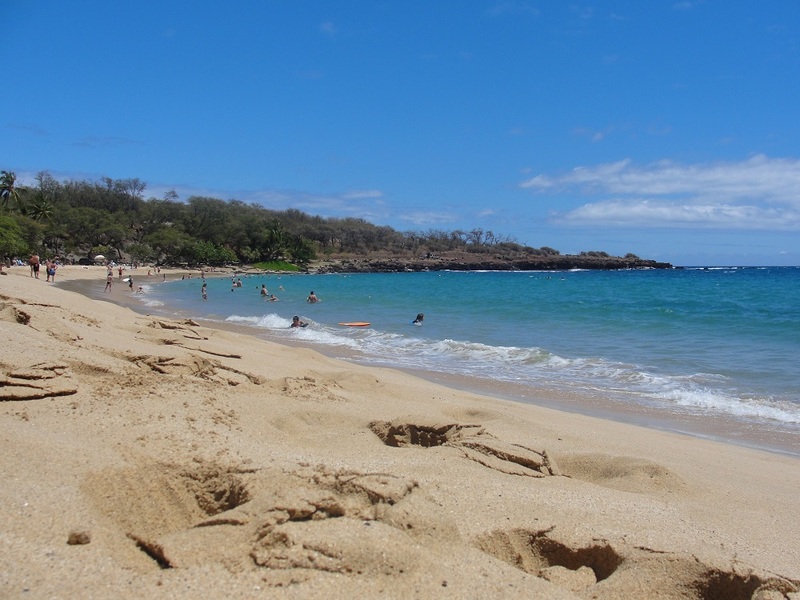 Hulopo`e Bay and Manele Bay are part of a Marine Life Conservation District where the aquatic mammals are protected. These spirited creatures can be seen from various vantage points on land and during sailing expeditions offered by Lana`i’s recreation companies. Aloha! 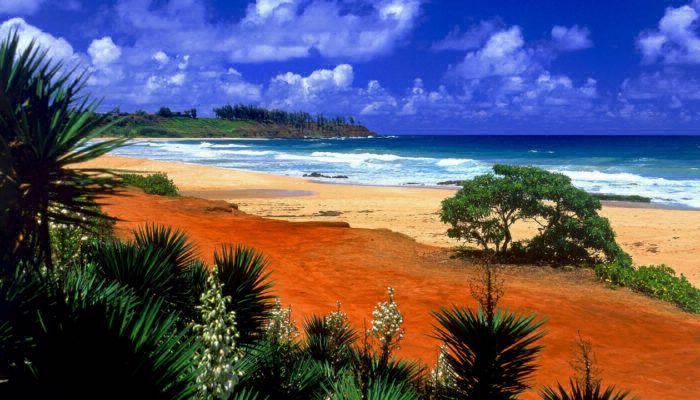 Bordering a marine preserve perched atop a rugged red-lava cliff above a white-sand beach, our ocean-side luxury resort in Lanai, Hawaii, will make you swoon - and the spectacular golf course with three cliff-side fairways will take your breath away. 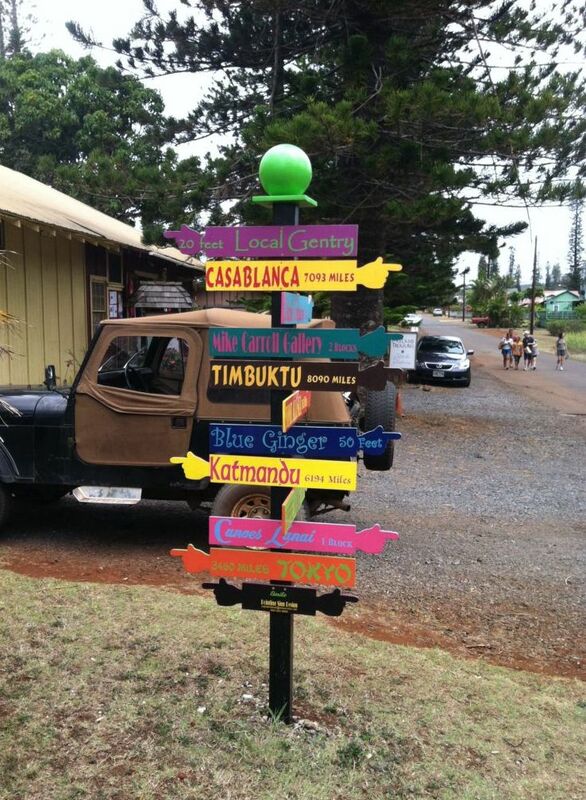 Like the other islands, Lanai has its own special unique flavor and feel. It’s one of the smallest islands, but don’t let its small size fool you – you’ll be surprised at how much Lanai has to offer. This charming island is home to just over 3,000 people, making it the perfect place for rest relaxation, rejuvenation, rediscovery and romance. 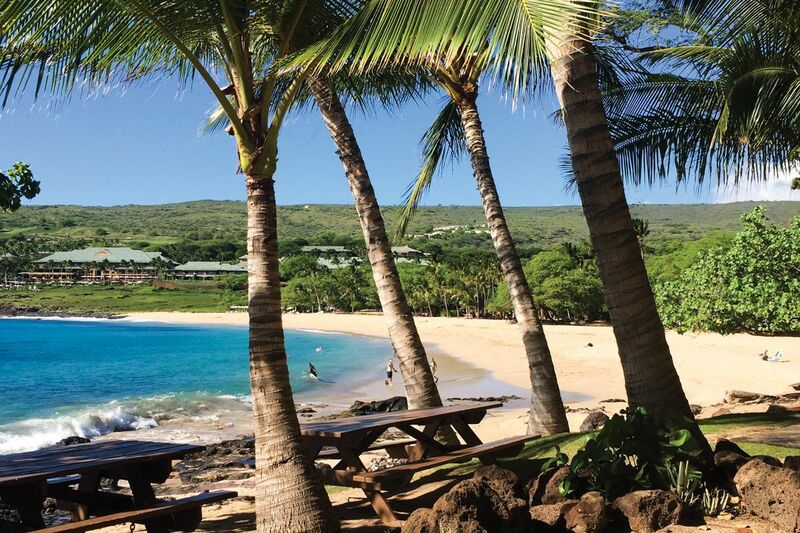 From beautiful Manele Bay to the bumpy road and scenic views of the Munro Trail, you'll find a wide range of activities to please just about everyone. Golf on two challenging courses or go snorkeling in crystal clear waters at Hulopoe Beach. The resorts also offer excellent services for your indulgence. A 141-square mile playground for children of all ages, Lanai abounds with opportunity for new discoveries. Here you can take your family on a thrilling 4x4 excursion into remote Keahikawelo or along the sands of Kaiolohia Bay to marvel at the rusting Liberty Ship grounded just offshore. Or spend a day peering into tide pools while keeping an eye out for spinner dolphins and humpbacks at play in the turquoise waters just beyond. Or learn an ancient art like hula or lei-making from a local resident eager to share in the island’s rich traditions. 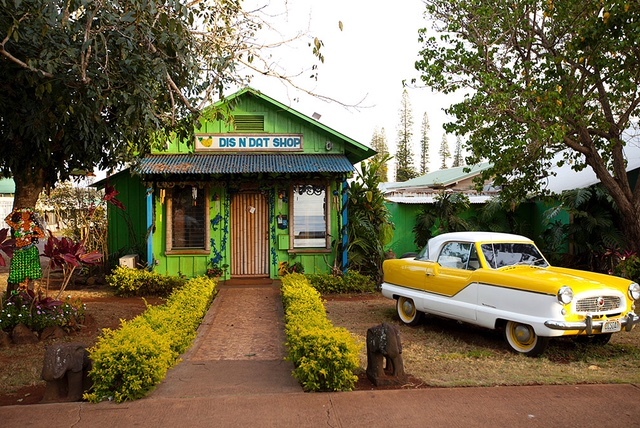 Yet with all the things to do here, Lanai is perhaps most attractive to families for what it doesn’t offer: crowds and traffic. With hardly any crowds and practically no traffic, what more could a parent ask for? More often than not, you will have an entire stretch of sand all to yourself. It’s no wonder Lanai is known as Hawaii’s “Most Exclusive Island.” While most visitors seem to enjoy just sitting and soaking it all in, you can also choose among popular water sports including snorkeling, scuba diving, sailing, and deep-sea fishing. One of the island’s most prized attractions is glorious Hulopoe Bay, a marine conservation area prized by divers and snorkelers for its vivid tropical reef fish. Here you can spend days splashing in the warm waters, where spinner dolphins are just as likely to frolic.